Just a quick heads up that the comments section is currently buggy when users use angle brackets for things like links or Bolding. Trying to figure it out still. Also want to give everyone one more reminder that this weekend I will be in Artist Alley at Snafu-Con this weekend, so if you will be near the Reno Nevada area, come say hello to myself and my kind hosts, Jade and Trevor from Shards. I googled "turkish men" for reference while drawing the barista. My results were half dressed young men with smoky eyes, and travelogues about holiday romances. It was not super helpful for drawing a coffee shop employee. Must be very epic pillows! could not help but read that in a song tone. 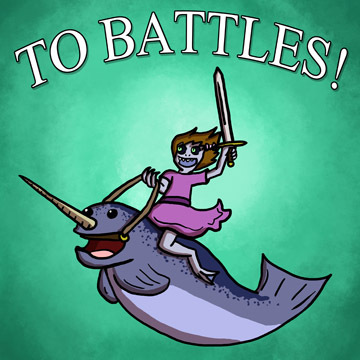 Now I want a narwhal steed. I’ve got to say, even if Google apparently wasn’t very helpful, I think you nailed the “Turkish Men” design. He actually looks a lot like a friend of my father’s (who is, by all accounts, a Turkish men), moustache and all. Does she go into battle at midnight? Just what has he been sitting on all these years? Next time google “old turkish men”. You get some of the smoky eyed, bare chested dudes, but you also get some normal looking people then. Be warned, ’tis a stubborn ear worm. Five internets says that Selkie makes a scene due to the guy going off on a rant about not wanting her infecting his customers. 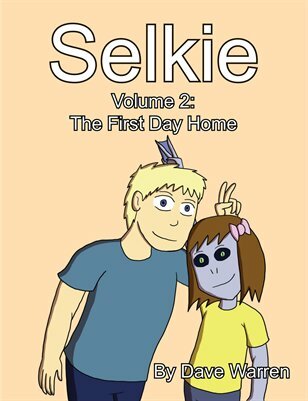 Selkie… watch the news. America is busy overreacting with illogical panic to three Ebola infections (well, at the time I’m writing this, anyway). Not only are you going to get thrown out, the restaurant will have to shut down and be sterilized roof to basement for 21 days. I’m kind of wondering what Selkie is able to eat here. Kebabs, for one. There was some delicious chicken kebabs I once had at a Turkish restaurant. Granted, I’ve forgotten if Selkie is allergic to seasonings, but I’m sure they can just grill some meat for her. that’s why you need to narrow your parameters… you want to add descriptors like: “butcher”, or “baker” to that search… you’ll get a bunch more pictures that are useful than the ones you actually ended up with. Granted after a couple of dozen, the search algorithm started kicking up crap as well, but it worked better than just “Turkish men” alone. Selkie learns the lesson all bright children must learn sooner or later: Sarcasm has limited utility. I was going to make an Ebola-related comment, but I have to go google “Turkish men” now! I know that the magic we’ve seen in the bow has been described as broadcasting the separation -and we’re all waiting for that to be resolved. But I wonder if it has a bit of disguising effect too.